For any application in which sanitation can’t be compromised, trust SEMCOR. We are a leading provider of industrial material and fluid handling solutions. For our clients in food and beverage manufacturing, pharmaceuticals and other sectors where contamination control is essential, we offer a wide range of sanitary industrial products that help manage risk and meet regulatory requirements. As a partner to manufacturers such as HabaGUARD® and Resistoflex®, we have a variety of off-the-shelf solutions ready to ship to you. We can also modify any existing sanitary industrial product to better match your specific application. Based in St. Louis, SEMCOR is ideally situated to provide fast, responsive service to customers throughout the Midwest. With an extensive inventory of products in stock and more than 100 years of customization expertise, we can help you meet the challenges of working efficiently in a clean environment. Get in touch with a representative today for assistance. SEMCOR sells both digital and analog gauges designed specifically for use in clean environments. When you need accurate pressure measurements but can’t compromise safety, we can match you with the right sanitary gauge for your process. Our products are easy to attach, easy to read and meet all requirements for use in pharma, food and beverage, biotech and other applications. You can browse our current inventory, or contact a SEMCOR representative directly. 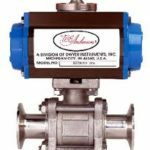 Our inventory of sanitary industrial products includes check valves, ball valves, butterfly valves, pressure release valves and more — all designed and engineered to offer superior contamination control in the most demanding environments. When picking a valve type, it’s essential to choose the right product for your application. For example, material viscosity and other characteristics can impact the effectiveness of certain types of sanitary valve. For assistance from one of SEMCOR’s knowledgeable process experts, contact us today. In the food industry, sanitary conveyor belting is a critical part of meeting HACCP standards for hygienic processing. For these and other applications, SEMCOR carries HabaGUARD antimicrobial conveyor belting. One of our most popular sanitary industrial products, HabaGUARD belting helps contain microbial growth and prevent food spoilage. Because food often comes into direct contact with belting, avoiding contamination at this stage of the processing chain is one of the best ways to manage risk and improve sanitary conditions overall. Sanitary pipe fittings — such as the Dixon fittings — are often used in the pharmaceutical industry to maintain product purity. Our inventory includes hose, pipes and tubing, as well as solid PTFE valves and other fittings necessary for a contamination-free work environment. Sanitary hose products are a necessary component to pharmaceutical and food processing applications among other industries and applications. Our inventory includes sanitary hose ready for the job from manufacturers such as Aflex & Resistoflex hose products. When safety can’t be compromised, count on SEMCOR for everything you need to move fluids and materials through your operation. Get in touch today for more information about our complete lineup of sanitary industrial products.